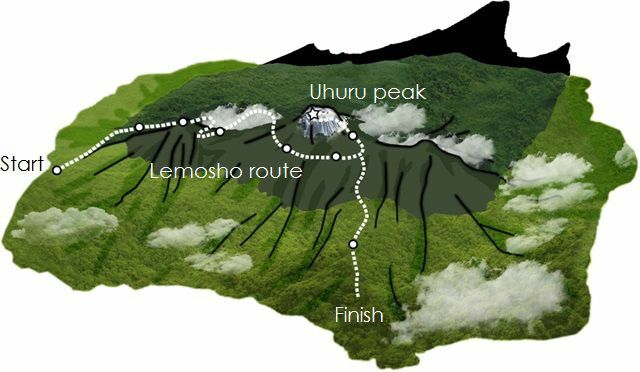 The Lemosho route starts on the Western side of Kilimanjaro and after 3 days it joins the trail of the Machame Route. This is a beautiful trekking route and offers climbers even more time to acclimatize than the Machame route since it is one day longer. Below you fill find all the information you need to help you prepare for Kilimanjaro. Also check out the detailed information link and you can click on the route map on the right to enlarge it. Once you arrive at the Kilimanjaro airport, you will be greeted by our driver and transferred to your hotel in Arusha. The rest of the day will be yours to do as you please; you may choose to relax at the hotel or explore the small town of Arusha (a short taxi ride away). You will have a preliminary talk to help you prepare for your Kilimanjaro climb via the Lemosho route. After an early start you will be collected from your hotel and taken to the Londorossi Gate (2250m). The drive will take around 2 and a half hours. Once at Londorossi Gate, you will be registered by the National Park authorities. From there it’s a further 15 km drive over a bumpy track into the dense rain forest to the drop off point where your trek via the Lemosho Route begins. You will follow a moderately steep track for around 2,5 hours, which leads you through an amazing and unspoiled natural forest until you reach the Big Tree Camp (2780m) where you will stay for the night. The long trek today starts on a small trail which continues through the trees and gradually ascends to reach the Shira plateau. You will have great views of the mountain and plains below. The path continues across the Shira Ridge (ca. 3600m) and you will stop for lunch at Shira Camp 1 after another few hours. During the last section (around 3 hours) you will climb another 250 meters in altitude and pass the surreal Senecia-plants, which can grow over 8m in height. Reaching the camp after the long day, you can relax with coffee and tea and be nourished with a 3 course meal tonight. As the sun sets you might see the summit glowing in the afternoon sun. You will gain 700m in altitude but descend to sleep at Barranco – 60m higher than the previous night’s camp. This will help with acclimatisation as you will go up to 4600m before descending again. Today begins with a long uphill in the direction of the Lava Tower Hut (4640m) and you will notice how the landscape changes to a rocky alpine desert. Later, the path descends again to the Barranco Valley with its giant Senecias and Lobelias. After six to seven hours you should arrive at the most beautiful camp on the mountain – the Barranco Camp. Today will start with the daunting Barranco Wall. Soon you will realize it looks worse than it actually is, but there are tricky sections where you will need to hold on tight. Admire the views from the top. The rest of the route follows along the mountain ridge into and out of the Karanga valley. You should reach Karanga Camp after lunch and you will have fantastic views of the southern glacier of Kibo as well as of the summit of Kibo. A few hours hiking through desolate and rocky moon-like landscape lies ahead. It will be a relatively easy day leading steadily uphill. The goal for today is the Barafu campsite on a narrow ridge in full view of Mawenzi peak. You will walk along a trail that passes through the afro-alpine dessert until you reach your destination for today – Barafu Camp at 4640m. Use the rest of the day to relax and pack your daypack for the summit attempt later tonight. Supper will be served early. Drink and eat enough if you can and try to sleep. You will be woken up around midnight to start your walk to the summit. It will be dark and cold as you set off just after midnight. You will need a headlamp to climb the frozen volcanic dust going towards Stella Point on the crater rim. This should take around six hours. The sun should be rising when you arrive at Stella Point. From there it’s “just” an hour or two more and you will be standing on the highest point of the crater at Uhuru peak. (5895m/ 19340ft). You are now on top of Kilimanjaro! There will be time for a short break for pictures and celebratory hugs before you tackle the steep and dusty descent. By now the volcanic ash will have thawed… You will stop for a short tea break at Barafu and then continue downhill for around three hours to Mweka camp (3080m). This is your overnight stop. Refuel by drinking lots of fluids and have a good helping at supper time. A traditional farewell ceremony from the porters begins the day. After around 3 hours of comfortably descending through the greenness of the forest, you should reach Mweka gate where the driver will be waiting. Back at the hotel a hot shower, a cold drink, a debrief and your certificate of achievement will be waiting. Well done! After breakfast, you can continue with your travel plans or catch the transfer back to the Kilimanjaro International Airport. If you have more time, check out our Safari and Zanzibar options or join one of our overland tours through East Africa.